Now and again I like to use ModelMayhem to help find new people to work with. I put a last minute shoot together to keep things interesting and put a challenge in front of me to think on my feet. As I usually like to do, we started with beauty shots. I find this really helps to break the ice and for myself and the model to get a little time to connect. Well, this was pretty quick and easy with Kim. She looks intense but she was very down to earth and easy to talk to and I remember being impressed on the day of the shoot that she would very easily go from smiling and laughing to being completely "in character". We had this nice exposed brick to work with so we played around with that for a couple looks. Kim has super long legs and I wanted to feature that in some of the images. She asked if I prefer working with taller models and I said, "Sure, as long as I have my step stool with me :-)"
We were running short on time toward the end and there was a couch I wanted to use so I moved it in front of my black backdrop to isolate Kim against the couch. Love what we got here. Thanks to Kim (model) and Sheila on make-up for making it a fun, successful shoot. 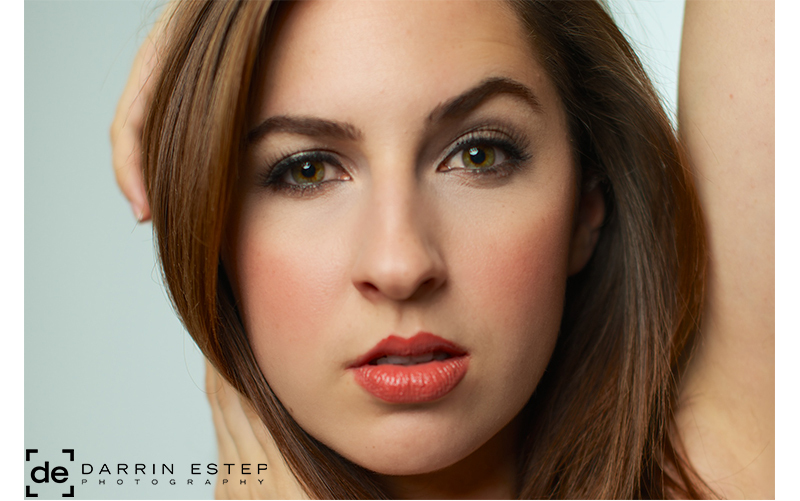 I’ve been wanting a beauty dish for years now and just never invested in one. For those not into photography, its a very popular light modifier mostly used for headshots that shapes the light very nicely on the subjects face. Photographer friends kept saying, “just go to Home Depot and make it on your own”. Nice idea but just not realistic for me for many reasons. I decided to get one and now I’m kicking myself that I waited this long. I think there’s a lot to learn with how to position the light just right to achieve the desired result but I'm very happy with my first try. Armed with this new toy, I posted a quick casting call on Model Mayhem and opted to work with Melissa (featured here) as my model. She was really fun to work with and had so much personality that comes through the camera. I also pulled in Lyndsey as the MUA that I’ve worked with in the past on this shoot. She was great once again in bringing the drama to an already pretty face. These last few (above) were actually natural light (e.g., no flash). Its funny how seldom I shoot without studio light but its fun to experiment with what you get from nice window light. Until next time. Continuing with my series of shoots I did while I was in Vegas this year for WPPI, the last one I’m writing about is with Corrie J. She models full time in Vegas and works various conventions and events, of which there are many in Vegas. When I first decided on Corrie, I was a little worried because she’s almost 6’ tall - and I’m not. I couldn’t bring a ladder all the way to Vegas so I improvised when I needed to be eye level with her (like standing on chairs :-)). I like the before and after shots so I put this comparison together for that reason. The one on the left is probably 5 minutes after she walked in the door. Here, I’ve got some of Bri’s work-in-progress with Corrie along with her kit spread out on the table. Some variations in a comfy chair that I really liked the angles on. Even though I’m featuring the one with her looking at the camera, I really like the shot on the right with her looking down. Then for something a little more edgy and dynamic for the ones below. Corrie brought a lot of clothes to the shoot. Her suitcase was bigger than mine and very pink. I wish I would have taken a picture of it but I didn’t. So, I thought it would be fun to show all the things she brought in an interesting way so we put all the clothes on the bed and had her pose as if she’s exhausted from the mere thought of having to pick something to wear. Fun stuff. A photographer friend of mine, Brian, put together a casual gathering to network and shoot at a place called StudiosLIC in Queens, NY. I met Brian at one of the first meet-up’s I ever attended in NYC in 2008 when I was first learning about photography and how to use light. For this shoot he brought a model he had worked with recently and others joined in the fun in front of the lens as the night went on. Jessenia is from Florida and new to NYC. She was very nice to work with, great smile and doesn’t need guidance however, she's also open to feedback if you want her to move or stand in a certain way. Mike is a guy that works at the studio and somehow ended up in front of the camera. I snapped a few of him as well. He didn’t seem to mind giving us his best for a little while in front of the camera. Overall, this was a nice opportunity to meet some other photographers and get a chance to play in a different space. Thanks Brian for setting it up! I love unexpected surprises. Three years ago I shot for the first time during WPPI with Meli and again in 2013 in the desert. Her husband Shayne, was my assistant holding a reflector in the desert with wind blowing and sand kicking up while Meli was doing her best to avoid the glare of the sun and not fall in the cracks of the desert floor. I like to balance between working with new and repeat clients for a variety of reasons. Funny enough, I had actually planned to work with one repeat model from last year and she was a no-show one hour before shoot time - you never know. Meli noticed, through the power of social media, that I was going to be in town and reached out to me to come by. After some texting, we worked out a small window of time to swing by. I had some other plans on the night we chose so we needed to make it quick. As soon as she came in the door, I got her in front of the camera and started shooting. To her credit, we managed to get a variety of images in about 30 minutes (which is super short for me). Meli is a very experienced model that needs no direction. She just knows how to emote these great expressions and move each time the flash goes off to vary the look each time. This one below was my favorite! This one has been added to my portfolio! And a few more with the pink fuzzy coat. Thanks Meli for swinging by. Once in a while I try to shoot something fun, something I find interesting. I posted on ModelMayhem (popular site for sourcing models, make-up artists [MUA], etc.) for a casting call to do dramatic headshots and was overwhelmed with responses. I chose Lyndsey, the MUA, almost immediately. She has great work and awesome review as well. The model took more thought and one consideration for me was that I don't have nearly as many blonds in my portfolio as I do brunets. I love doing these kinds of shoots. Next time, I'll give myself more time to explore! Last year, I shot for the first time working with Melissa and we hit it off. 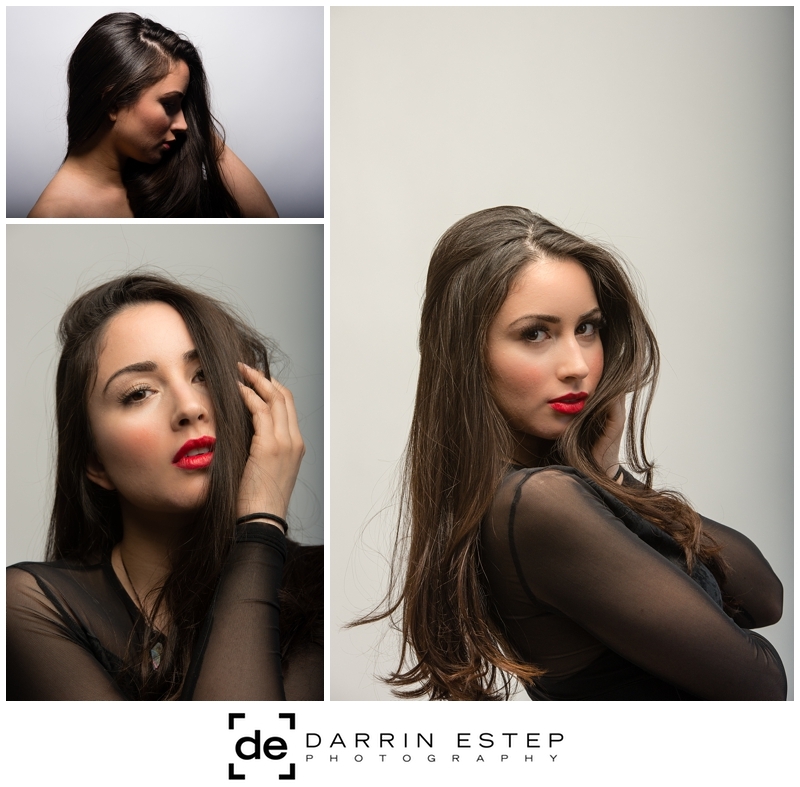 She’s so great to work with and this session was just as awesome. We proved again that spending some time before the shoot going over various looks via Pinterest and choosing outfits and accessories is a valuable activity. I snapped a couple shots of Amanda & Melissa before we started shooting. She has so much hair that it turned out to be a bit of a blessing and a curse. Styling all that hair takes time! Images that resonate with me have a simple composition and draw your eye directly to the subject. I have a pretty simple lighting set up here that helps achieve the look I'm after. Finally got to use my fan! - Thanks Amanda for standing in to help. Hair everywhere. 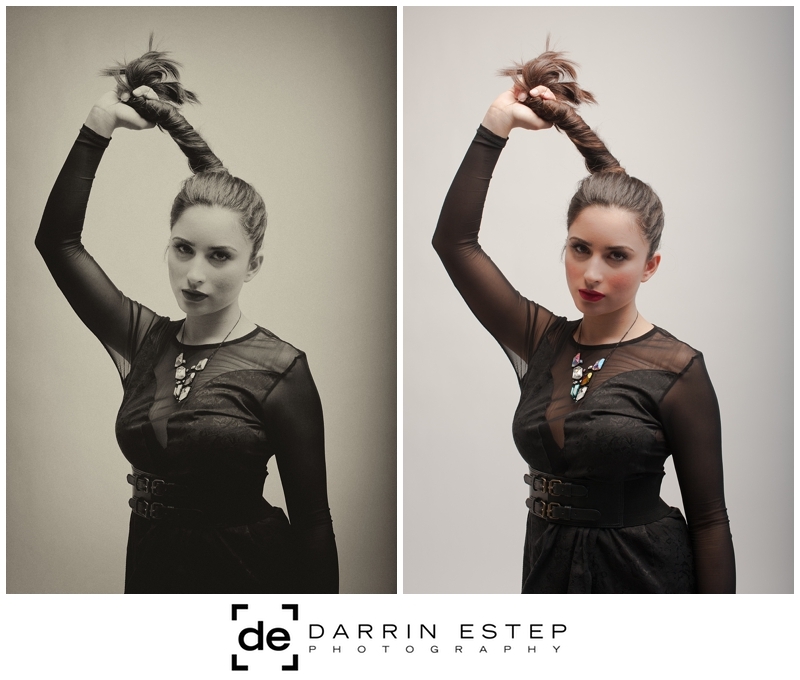 One of my favorites of the day was this composure where Melissa created her own frame. The location I used was a little different than what I've used in the past. I used a service called Breather where you can rent a small (and I mean Manhattan small) room by the hour. Its a great business idea and someone else suggested this as an option so I thought I’d give it a shot. Once we navigated our way to the room, I noticed this set of stairs and made that a second shooting location. This turned out to be a bonus of shooting on the weekend since nobody was traveling up and down the stairs. And a few more back in the room to finish off the shoot. A big thanks to Melissa for coming out to NYC from Boston and for Amanda for showing us her talents on hair and make-up. I'm looking forward to the next shoot! Round two shooting for a person I've only met through some email exchanges. Its a little unusual with photography for things to happen this way but the reason this works is that the client isn't the subject of my images. The lovely Kait is. I first met Kait on a tattoo shoot (surprise there) and we've connected a couple more times to shoot - one of which was this one to grab some photos of some casual clothing options for a brand called Strong Minds Apparel. Here are some images from our recent shoot. I made another trek out to Vegas this year for WPPI which is an annual conference for wedding and portrait photographers...and video. They're increasing their coverage of the video world which was nice to see. I attended several classes during my time there and came away with new inspiration and ideas to implement. My interest was a mix of business, marketing, and some technical classes. Some sessions were with a very large crowd by well known photographers and others were in a smaller venue by lesser known (at least to me) professionals. I really preferred the smaller sessions. Two reasons I enjoyed these more: 1) They aren't trying to sell you anything and 2) They have so much more meat to their presentations because - you guessed it - they're not trying to sell you anything! There are marketing opportunities everywhere. Watch for them and take the time to think about how to approach them in a unconventional way. Find ways to partner with other businesses that provide them with nothing but an upside. Stay organized with regard to obtaining and utilizing contacts. For portraits: Own it. The difference between an okay portrait and fantastic one is the direction you give and the connection you make with the client. Choose your lens wisely to tell your story. This year there were several presenters talking about being deliberate about lens choice to make your images stand out. There were many more but these are some that stuck with me. While I was in Vegas I arranged for a photo shoot to happen. 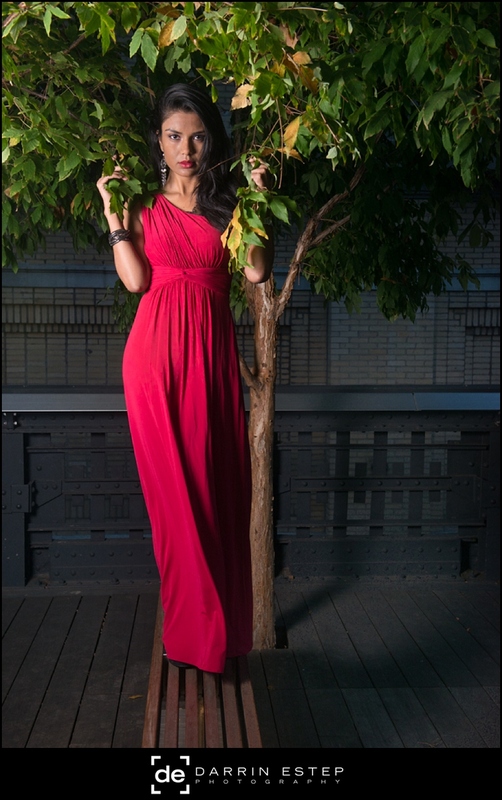 I planned this out months ahead of time and worked with the model to stylize the shoot. I also had a make-up artist (MUA) which makes all the difference in the final output. Cody at work to work his magic on Dahlia. We started with headshots and worked our way into other poses and looks. Here are some from the session. A few more looks from Dahlia. This cat mask and the meoow shirt was part of the collaboration on the shoot. Proof that a good team can make for some great images. Shortly after shooting with Stephanie, I was introduced to Rose who works with the same modeling agency, Aqua Model Management, as Stephanie. We met in mid October and I opted for a place I’ve shot several times now and just love it for the flexibility and diverse set of scenes that can be created in this environment: The Highline. As I try to do each time, we started with some simple headshots. Here are a couple of my favorites. We then moved into some “casual” - just girl hanging out in the park kind of images. One thing I learned about Rose while shooting with her is that she’s from Madagascar like one other model I’ve shot with several times - Anna Laura. Pretty cool. Small world! Rose also had this ability to turn on a very real looking smile simply by asking. Harder than you may think. Next setup wasn’t planned but it was one of those things where I walked by an area that I thought would look pretty nice and snapped this one (after sorting out some technical issues). 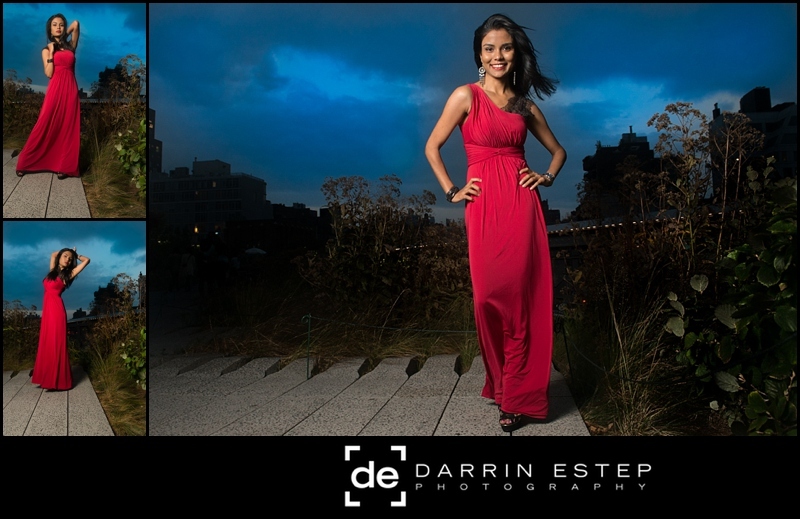 Finally, with the fabulous red dress on, captured some powerful images against the darkening sky. One thing that remains the same is that the idea I start with isn't the one I end with. I’ve come to expect that and I do my best to go with it when a curveball is thrown. I planned this shoot several months ago with another model and then learned a few days before the shoot that the dates were confused by her and consequently she wasn’t able to make it. I turn to sites like ModelMayhem when things like this occur. I posted a modeling opportunity and very soon after that I met Steph. She came across as very funny and approachable from the initial response and she turned out to be a great choice for this shoot. The team was small. Steph is the model, Numi on make-up. It deserves a shout out to Nicholas & Alejandro at Space 4 Shoots. They have always been very helpful during the shoot. I like to start with some beauty shots. I find that it helps establish a rapport with the model and hopefully allows for some nice shots of the face in the meantime. Next up was a shot based on a concept I saw from a Dior ad. I felt like going for something kind of dark and moody. We started with the inspiration and moved away from that idea throughout this setup. As we worked a bit more with this general lighting setup, I wanted to try some product shots with Steph so we used a perfume bottle she brought to the shoot and here are a few of my favorites. Numi was very helpful as well with suggestions on holding the bottle. It's harder than you think to get something that conveys the right emotion without looking awkward. 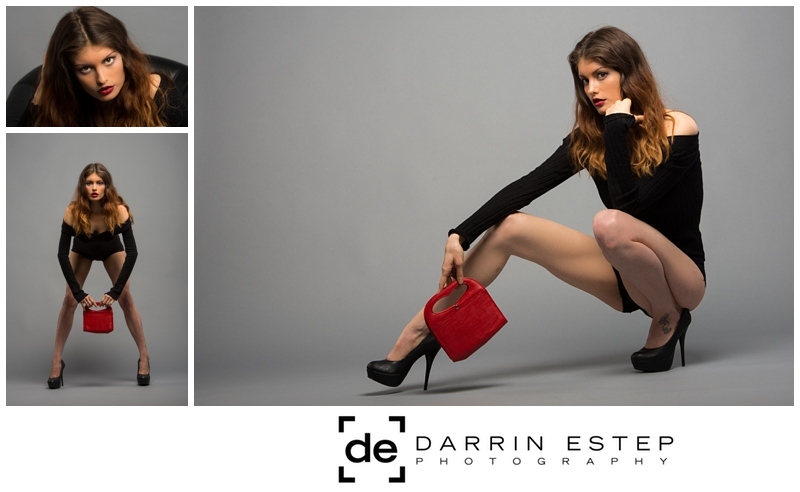 Quick outfit change and a new lighting and background setup and I found myself to still be in a product mode so we had her show off a red purse and a black necklace. For the last set, we dragged in a chair from the waiting room where there was a casting going on for a dance performance (random tidbit). I thought this layout arrangement below was fun with the legs closed and open. Lots of fun working with this team. I hope we can all work together again soon. I don't normally post pictures of myself in the blog entries however, I thought this one was kind of funny because I look so serious however, this was taken during a lighting test by someone in the studio and he just happened to catch me at a time when I was probably focused on thinking through the next setup. I liked this location so much that I had to go again. I had a day off recently and organized a shoot with Aneta which, as it turns out, is from Prague and visiting with her boyfriend for the summer. Glad I caught her why she was here in NYC. Helping out, in more ways than one was Seqoiya, the MUA that operates under Pure Glamour. She was great and helped with both hair and make-up and also helped with some lighting too. I scouted out the next location but it was a little further than I wanted to go. I came across these stairs and knew I had found our next spot. It's a little funny (now) how long it took to get these shots with all the time we spent waiting for people to clear the stairs. Several years ago I met Eunice through a meet-up photo-shoot in NYC in 2009. Turns out her friend Melissa saw the images of Eunice and was curious what fantastic professional (I'm embellishing quite a bit here) took those images. We had been trying to connect ever since. Melissa lives in the Boston area and back in the day was roommates with Eunice and competed in beauty pageants together and have been friends ever since. Melissa has picked up a few honers along the way: Miss Rhode Island Latina, Miss US Latina (where she met Eunice), and Miss Colombia New England. Very impressive! I had a couple concepts I wanted to try out and Melissa was very receptive in collaborating on the ideas. I think it helped to bring this shoot to another level. I brought in a make-up artist, Nicole, that I worked with one other time and we were set. Last but certainly not least. This image was the very last one we did for the day and I'm so glad we tried it because I feel like this is my favorite image that I've ever taken. I was standing on a laddar with Alejandro (studio guy) holding it below. Two lights were on Melissa; one camera right (main light) and the other was camera left slightly behind her. I just asked her to twirl around with this great dress she had. We grabbed several like this but this was the favorite of the bunch. What you don't see here is all the clutter that was in the original image. A big thanks to Prerak for helping bring this image to life! As promised from my WPPI post, I can now share some images from the shoot I setup while in Vegas last month. Since I already described the whole scenario in another post, I won't take you all through it again. Let's get to the images. I shot about 150 images and with some work was able to narrow it down to a handful to share here. I've also posted a few of these back in the overall portfolio. First, some make-up for the "talent" :-) The make-up artist (MUA) here is Summer. We were at her place for about an hour to do hair & make-up for Meli. This is the second time I've worked with Meli - here's a link back to the first time. The first post of 2013. Psyched. In December, I arranged to take some updated headshots for Joe. He owns an Agile consulting company called Incrementor. Being opportunistic, I thought I would also schedule time with a model since I was going to have a studio and a little time to shoot - why not? This post is about why I called this entry, "Plan C". In addition to the time with Joe to update his headshot, I booked two models to shoot with to build my portfolio, and theirs. The first model canceled a week before the shoot, the other, the morning of. Oh boy. What do i do? I turned to the internet gods and posted a casting call for another model and crossed my fingers that the make-up-artist (MUA) wouldn't cancel as well, fortunately she didn't. I screened several models during the day and had a great response to this second posting. It was about lunch time and Andrea called me. We spoke for a couple minutes and I could tell from her tone that she was going to be great to work with. Turns out she's from California (and so am I) so maybe that's what felt right. Coincidentally, a friend of mine from High School, Eric, was in town on vacation so he helped out with the shoot and took some behind the scene shots (see below). It was great to catch up. We split up the shoot to have the first part of the session focused on very simple concepts, then had Nicole (the MUA) work with Andrea on a different look for the second half of the day while Eric and I worked with Joe on his headshots. I've posted some of my favorites from the work with Andrea. Also, great work on the make-up, Nicole. I'll post some images from Joe in a future post. As I mentioned, there were also some behind the scene shots Eric captured. The first one makes me wonder why I pointed and extended my leg the way I did. Funny when you see the things you do. As I wrote in another post, I recently took a trip out to Vegas for a very large video conference called NAB. Another thing I arranged for while I was there was to shoot with at least one model (tried for two but didn't work out) while I was there. I posted a casting call for models for the dates I would be in Vegas a couple months back on a site I've used in the past called ModelMayhem. Its a great place to find models, make-up artists and other professionals in this space to help each other build up each others' portfolio. The model I chose was Meli. She's done quite a bit of modeling and has started to rely on this as her primary source of income. As it turns out, she was also modeling in the Canon booth for NAB. Who knew!? I also arranged for a co-worker to help me out with the shoot as he was interested in the shoot and I was interested in showing him how I work and getting a little help in the meantime. Meli arrived with her husband and a bunch of potential costume changes. We're ready to go! We started off simple doing beauty shots and moved into some other concepts. Ultimately I'm trying to communicate emotion and tell some stories in the images. I've included several of my favorites. More can be found on the gallery. I heard the song on the radio that has this phrase and it reminded me that I needed to write about a recent shoot I had with Anna. I met Anna through another photographer friend of mine, Lou. They're both from the same country, Madagascar. Anna came to a meetup style shoot a few years ago where you have a bunch of photographers, models, and make-up-artists get together for the sole purpose of everyone working on their portfolio. Once in a while, I like to pull together a really simple shoot to accomplish the same goals...keep the portfolio fresh with new material. Anna has - uh - a few things going for her here. First, she's super nice, speaks French, which is always fun to listen to, she's easy on the eyes (stating the obvious), and she's totally professional; show's up on time, no drama, respectful, etc. She mentioned she was able to be an extra in an upcoming feature film. I'm hoping she'll remember our work when she's famous :-) Oh, and I forgot to mention that she makes my job super easy because she just magically falls into these great poses without me needing to guide much at all. Love it! This particular shoot was pretty short (setup to breakdown was probably 60 minutes). There were less than 100 photos taken. Enjoy a few of my favorites. Brandy is someone I met quite some time ago. She's a good friend of my sister's and has recently moved to NJ to be with her husband and to invest her energy in attending auditions for NYC Broadway plays. Exciting stuff. She's spent a few years in Las Vegas in great performances and is now trying her luck in NYC. When I first met Brandy, she was in grade school. She's now all grown up and here to make her mark on the east coast. She saw a post I did on this blog and sent me a note through Facebook offering to help out on a future shoot...I got to thinking and thought she'd be better in front of the camera vs. behind it. I think I was right. Check out a few of my favorites from our session. Next up. A shoot with her and her husband. Stay tuned for that. A good photographer friend of mine, Lou, let me know of a concept shoot he was putting together in the city. "Let's shoot in the city with some high fashion models and make the best pictures ever! ", said with his french accent. How can you turn that down? On a Monday night a few weeks ago I make the trek into NYC to a studio I had been to one time before. Beautiful space - especially for the price. By the time I got there, lights were already setup and Lou had done some test shots with one of the models. Hair and makeup were almost done with the second model and we were ready to shoot. We took turns with the model and various setup's. This time we had professional hair and makeup which makes such a huge difference. Below are a few of my favorites. Check out the Gallary page for more of my work.